An updated website featuring a wide range of portable precision pipe and tube beveling tools for onsite boiler tube and pipeline and in shop pipe fabrication is being introduced by ESCO Tool of Holliston, Massachusetts. 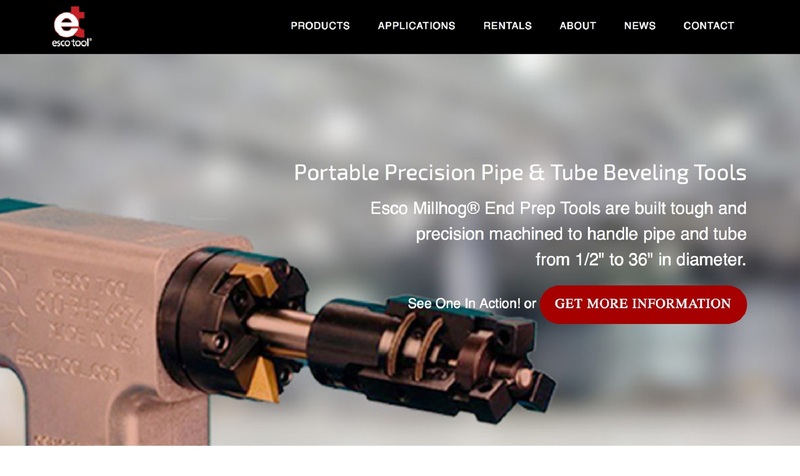 The ESCO Portable Precision Pipe & Tube Beveling Tools Website features Millhog® end prep tools that can bevel, face, and bore without cutting oils; air powered saw kits for cutting pipe without leaving a heat affected zone; and rolling motors and tube expanders. Included are product specifi-cations, motor and drive options, key features, applications, and videos. Easy to identify the Millhog® end prep tools suited for pipe and tube from 1/2” I.D. to 36” O.D. and saws for pipe from 6” to 60”, with click-through for specifications, the ESCO Portable Precision Pipe & Tube Beveling Tools Website describes their rental tool program, company background, and has an extensive archive of new product and product application news releases.